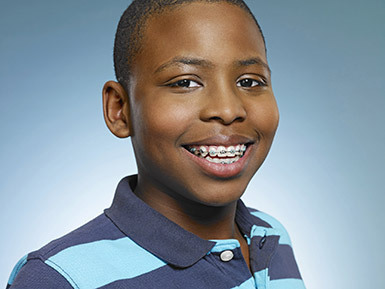 Adolescent treatment is what most of us think of when we think about orthodontic treatment. This is when we use brackets, arch wires and elastics to properly align teeth. Your child will come in every six to eight weeks for adjustments. Treatment typically lasts 18 to 24 months. Why is this a good time for braces? Your children are going through a growth spurt at this development stage. Most of the adult teeth have erupted. For boys, they’re still growing at age 13, which is a good time to start treatment with brackets and arch wires. Girls typically benefit from starting treatment sooner than boys. Once girls start puberty, skeletal growth slows tremendously. This is also an ideal time for treatment because many of your child’s peers also are in treatment. 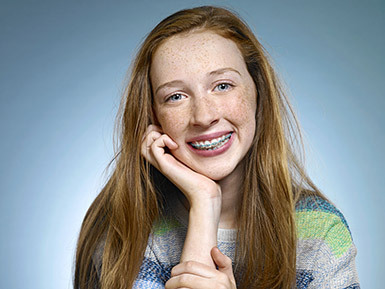 Braces tend to be a rite of passage at this age, which often lessens feelings of self-consciousness during treatment. Orthodontic treatment for adolescents does more than create beautiful smiles. Dr. Chris Tsintolas witnesses daily transformations of personalities and self-esteem, thanks to orthodontic treatment for adolescents. Adolescence is a time in your children’s development when they often are critical of the way they look. Perhaps they’re teased about their teeth at school. Orthodontic treatment is transformative. It improves smiles and removes what can be a significant source of embarrassment. Our young patients frequently begin treatment not wanting to show their teeth when they smile, but they proudly show off those pearly whites on the big day when their braces come off. One of the many benefits of undergoing orthodontic treatment during adolescence is completing it before going away to college. Although treatment can be done at any age, being in treatment during the college years adds a level of complexity when your young adults are away at school and it is difficult to come home for orthodontic appointments. Adolescents increasingly care about esthetics during treatment and request translucent, tooth-colored braces, or Invisalign Teen®. We are happy to discuss all options when we recommend a treatment plan; please schedule a complimentary evaluation.